1782: he starts his career as a disciple of the star Iwai Hanshirô IV, who gives him the name of Iwai Karumo. 11th lunar month of 1787: Iwai Karumo takes the name of Iwai Kiyotarô II at the Moritaza, performing in the kaomise drama "Tsuranaru Edamure Takamatsu", which also celebrates the shûmei of Sawamura Kameemon and Sawamura Harugorô II. 9th lunar month of 1790: the play "Yoshitsune Koshigoejô" is staged for the first time in Edo, at the Ichimuraza; it celebrates the onagori kyôgen of the Kamigata star Asao Tamejûrô I; Kiyotarô plays the role of Izumi's wife Takanoya [more details]. 8th lunar month of 1793: premiere at the Kawarasakiza of the Nagauta-based dance-drama "Tsuki no Kao Monaka no Natorigusa" (commonly called "Oniji Hyôshimai" in the Kabuki repertoire); Kiyotarô plays the role of Matsu-no-Mae [casting]. 9th lunar month of 1796: the play "Hikosan Gongen Chikai no Sukedachi" is staged for the first time in Edo, simultaneously at the Kiriza and the Miyakoza; Kiyotarô plays the role of Ichimisai's younger daughter Okiku in the latter theater [casting]. 6th lunar month of 1797: the dance-drama "Tsumoru Koi Yuki no seki no To" is revived for the first time, at the Kiriza; Kiyotarô plays the roles of Ono no Komachi, the courtesan Sumizome and the spirit of Komachi's cherry tree [casting]. 3rd lunar month of 1800: his master Iwai Hanshirô IV dies. Later on, Kiyotarô becomes disciple of the actor Ichikawa Yaozô III. 7th lunar month of 1804: premiere at the Kawarasakiza of Katsu Hyôzô I's drama "Tenjiku Tokubê Ikoku Banashi"; Kiyotarô plays the roles of the sendô Tenjiku Tokubê (in reality Ogata Jûrô), Konomura Ôinosuke and Mashiba Hisayoshi [casting]. 11th lunar month of 1804: his master takes the name of Suketakaya Takasuke II at the Ichimuraza; Iwai Kiyotarô II takes the name of Ichikawa Yaozô IV at the Nakamuraza, performing in the kaomise drama "Kiku Zumô Mikurai Sadame", which celebrates the shûmei of Iwai Hanshirô V and Nakayama Bunshichi III. His son makes his debut on stage (hatsubutai), receiving the name of Iwai Kiyotarô III. 11th lunar month of 1806 ~ 1813: long stay in Kamigata. 6th lunar month of 1808: tour in Nagoya for a troupe led by Kataoka Nizaemon VII, Nakayama Tomisaburô I, Ogino Izaburô II, Ichikawa Ichizô I, Nakayama Bungorô I and Yaozô; they perform at the Tachibana no Shibai in dramas like "Keisei Takasago no Matsu", "Futa Meoto Sarashi no Hinagata" or "Azuma Kagami Mikari no Maki". 3rd lunar month of 1813: Yaozô goes back to Edo and plays at the Nakamuraza 3 roles in the drama "Sono Omokage Date no Utsushie". 12th lunar month of 1818: his second master Suketakaya Takasuke II dies. 1819 ~ 1845: he becomes a travelling actor and performs under the name of Ichikawa Datejûrô. There is quite a lot of confusion regarding the end of his career and one question has to be solved: who held the name of Ichikawa Yaozô between 1827 and 1834? One actor or two actors? It is written in the "Kabuki Jinmei Jiten" that Ichikawa Datejûrô went back to Edo in Fall 1827, taking back the name of Ichikawa Yaozô IV and playing at the Nakamuraza the roles of the gold trader Kichiji and Motoyoshi Shirô Tadahira in the drama "Kinbusen Yosooi Genji". The same roles are also credited in the same book to Ichikawa Yaozô V, who played them to celebrate his shûmei at the Nakamuraza. The actor performing under the name of Ichikawa Yaozô in the 11th lunar month of 1827 at the Nakamuraza was also recorded as playing the following year (in the 3rd lunar month of 1828 in the same theater) the roles of Taira no Atsumori and Kumagai Kojirô in the epic drama "Ichi-no-Tani Futaba Gunki". These roles are usually perform by young actor, which logically excludes Ichikawa Yaozô IV as he was in his 50s around that time, whereas Ichikawa Yaozô V was at the beginning of his 20s. Another good example of this impossibility is the role of Koganosuke in the drama "Imoseyama Onna Teikin", which was staged in the 8th lunar month of 1830 at the Nakamuraza. The Ritsumeikan University Actors Database, which is more coherent than the "Kabuki Jinmei Jiten", does not help us fixing this issue as it says that Ichikawa Yaozô V took this name not in the 11th lunar month of 1827 but in the 3rd lunar month of 1835 and that Ichikawa Yaozô IV retired from the Kabuki world in 1834. 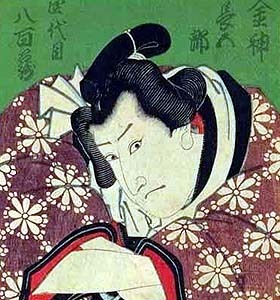 The "Kabuki Nenpyô" says that an actor named Ichikawa Datejûrô took the name of Ichikawa Yaozô II (!!) in the 11th lunar month of 1827 in Edo (theater not specified - it is just a name in a list of minor actors like Segawa Ayame, Kataoka Kyôshirô, Onoe Sukejirô or Onoe Iwagorô) and that an actor named Ichikawa Yaozô, who was returning from Kamigata, performed the roles of the gold trader Kichiji and Motoyoshi Shirô Tadahira in the drama "Kinbusen Yosooi Genji". Mixing all these pieces of data, kabuki21.com has decided to write that Ichikawa Yaozô V took this name in the 11th lunar month of 1827 and that Ichikawa Yaozô IV kept it up to Fall 1834. Ichikawa Yaozô IV made a career in acting with many direction changes: he started as a wakaonnagata actor, trained by Iwai Hanshirô IV, one of the best Edo onnagata. He left the Iwai clan to join Ichikawa Yaozô III and became a tachiyaku actor. Then he became a travelling actor and left Edo. His forte were jitsugotoshi roles and roles in the wagoto style. He was also said to be an excellent dancer.